If I had a dollar for each time I've been asked this question..."Dave, how do we automate our daily system checks to free up our technical team?" I could probably afford to buy Skynet. The following SAP Solution Manager 7.2 scenarios are based on out of the box delivery - not requiring custom development from developers who never finish anything or expensive third-party tools. Once you load your toolbox with these modern tools, your technical team can get off the daily checks bus and time travel to the S/4HANA readiness check. I recommend optimising and tuning the standard SysMon reporting templates delivered by SAP Solution Manager 7.2 SP6. SysMon gives you the visually stimulating proactive monitoring dashboard - ready for the big screen in the Operations Support area or on your second monitor. Everyone loves a dashboard, the traffic light colour-coding both simplifies the message for every passerby and gives you an air of mastery. As you would expect, forward navigation helps you quickly drill down to the root cause of any incident. If your team is still a touch old-school, why not set up key exceptions to be e-mailed to a distribution team or search the vast exception store for problems which occurred the same time last month. In the example below, we can create a list of key ABAP based transactions we need to know about in SysMon. Yes, of course, you can get it onto the dashboard and have e-mail alerts if you wish. In the example below, the Root Cause Analysis tile contains exceptions, which are sent to the SysMon dashboard or e-mail alerts (or both). 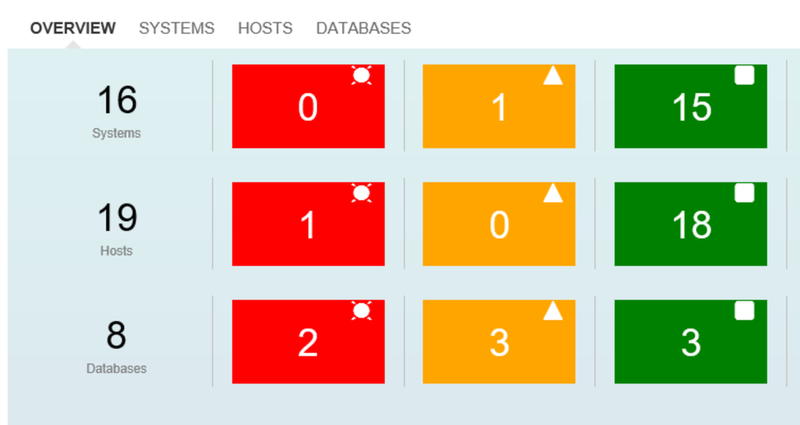 In the unlikely event that the Solution Manager system is down, you can still get EmergMon to display a dashboard of errors. EmergMon is based on CA Wily Introscope instrumentation which has access to all alert data from SAP Managed System Diagnostic Agents and hostcntrl. This means you get access to Operating System, Database and Application metrics right out out the box. As you would expect, forward navigation helps you quickly drill down to the root cause of any incident. So when I'm not watching Terminator re-runs or applying patches to my S/4HANA On Premise systems, you can find me cruising my favourite TechOps Wiki.